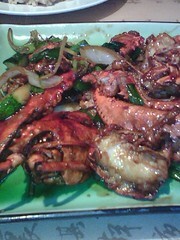 That lobster was stir-fried with scallions and ginger, as was my friend’s shrimp dish, although she requested a little garlic in hers, which they happily provided. MeeMah is worth a visit, for the dish of simple Asian slaw that starts a meal (in place of those greasy fried noodles), for the good menu, and very pleasant service. They brought us extra napkins and several moist “towelettes,” for after my messy meal. They offered brown rice without our asking. Water was refilled. Life is good. Faith, thanks so much for this great info! I had thought Great Wall was gone, and this is such a perfect location, because one is always looking for a quick and wonderful place to eat before the movies at the Montgomery Cinema. And I haven’t eaten lobster this summer either — not even during my week in Maine! Used to be you could eat lobster at the dock with the works for $14.95, but this summer it was more like $28 for a one-pounder. Justin explained to me that the lobstermen have had to raise the price because of the higher gas price they pay to take out the boats. 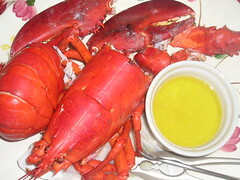 Bummer, but nice to know I can have such wonderfully prepared lobster so close to home! Thanks for making our gustatory lives better. Oops, I meant Mrs. Chow’s, not Great Wall.